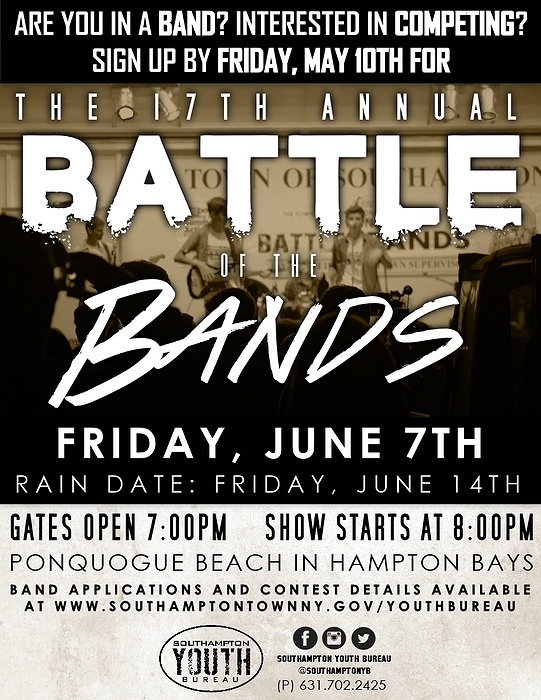 Subject: LongIsland.com - Your Name sent you Event details of "17th Annual Battle of the Bands - Band Applications Now Available!" Qualifying bands must have at least one high school student who resides in the Town of Southampton, and a band must consist of a minimum of 3 performing musicians. To download an application, please visit www.southamptontownny.gov/youthbureau and click on the Southampton Youth Bureau’s online calendar. For more information, please call (631) 702-2425.